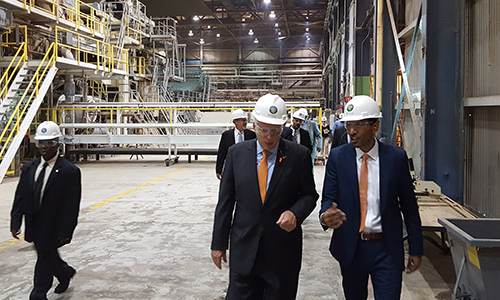 Sahil Tak is overseeing a $35 million expansion at the ST Tissue LLC plant in Isle of Wight County near Franklin. When the company announced expansion plans in September, it said the project would create 50 additional jobs. The plant already has hired some workers for new positions and now has a workforce of nearly 100 employees. “We will probably be up to 50 [new hires] by the beginning of next year,” Tak says, noting that the new jobs have an average salary of $53,000. Tak owns the Franklin plant with his father, Sharad Tak, a Washington, D.C.-area entrepreneur who owns companies in several industries, including power generation, engineering and information technology. Using recycled materials, the Franklin plant makes tissue, paper towels, napkins and hand towels for the foodservice, hotel, lodging and janitor-sanitation industries. As part of the expansion, the plant is adding a converting line, which will enable it to cut large paper rolls into finished products. Previously, the plant sent its paper to another company for converting. During the second part of the expansion, scheduled to take place early next year, the plant will add a second tissue machine, which is expected to increase production capacity by 50 percent. The ST Tissue plant is located in part of the former International Paper mill, which the Taks bought in 2012, two years after the mill closed. The Taks founded ST Paper & Tissue in 2007 in Oconto Falls, Wis., after buying a mill that had emerged from involuntary bankruptcy. The Taks looked at several mills nationwide that were underperforming or closed. The Franklin mill stood out because it was in good condition, and its location could serve customers on the East Coast. “The workforce knew how to make paper, and the mill’s environmental permits were in place,” Tak says. In choosing the International Paper site, ST Tissue received a $167,500 grant from the Commonwealth’s Opportunity Fund and a matching grant funded by Isle of Wight and Franklin. ST Tissue invested $60 million in renovating the Franklin plant and started production at the plant in 2013.